The WAH111C.BA0850 TAG Heuer Formula 1 Men’s Watch is a pure racing-inspired watch that boasts a style made for any man on the go. The most striking feature of the TAG Heuer Formula 1 is its dial. Housed within it are two subdials: a small second timer at 3 o’clock and an alarm located at 9 o’clock. At 6 o’clock is a “grande” date counter, which displays the date with two separate counters, rather than one. The indexes are hand-applied, and the hands and facets both have polished finishes. The markers on the hands and indexes are luminescent. A colored TAG Heuer logo is prominently displayed at 12 o’clock. Other note-worthy features of the Formula 1 include its case, which is a circular fine-brushed and features a screwed case back that has a special checkered decoration. Its bezel is a polished stainless steel unidirectional bezel that has black engraved figures at 5 minute intervals. 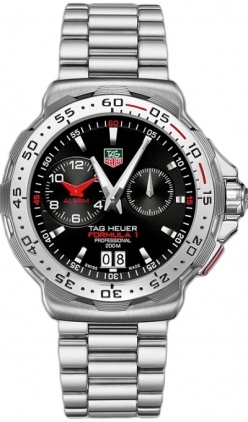 The crown is also polished stainless steel and sports a raised TAG Heuer logo. It also has polished stainless steel push buttons, with the alarm push button identified by a red line. The watch has a scratch resistant sapphire crystal and can be fitted with either a stainless steel bracelet or a printed black rubber strap. The TAG Heuer Formula 1 is an action ready watch that would make a perfect addition to the collection of any man with a face-paced lifestyle. I just got this watch today. I walked into my favorite jewelry store and wasn’t looking to buy a watch. When I saw this in person it was amazing. The online pictures don’t do it justice. The design and craftsmanship is nice and crisp. It’s very readable in normal light. Makes a nice everyday watch and any wrist very handsome.